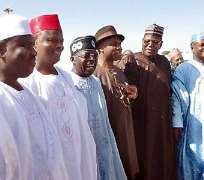 The APC on Thursday embarked on a membership drive to Dutse, Government House, meeting with embattled Jigawa State Governor, Sule Lamido. The APC membership drive team was led by its national leader, Asiwaju Bola Tinubu and the national chairman, Chief Bisi Akande. Governor Kayode Fayemi and Lai Mohammed among other leaders were on the team. Tinubu told the embattled Jigawa State that as a progressive, he was in the wrong party and had no reason to be in the PDP. He reminded Lamido that he was a member of the defunct Social Democratic Party, SDP with the rest of them. Governor Sule Lamido while telling the APC leadership that he remains a member of the PDP announced that his eyes are wide open and searching for soul mates he could team up with. The team also took their membership drive to Governor Rabiu Kwankwaso of Kano State.